• Bathroom water pressure and temperature were reliable. 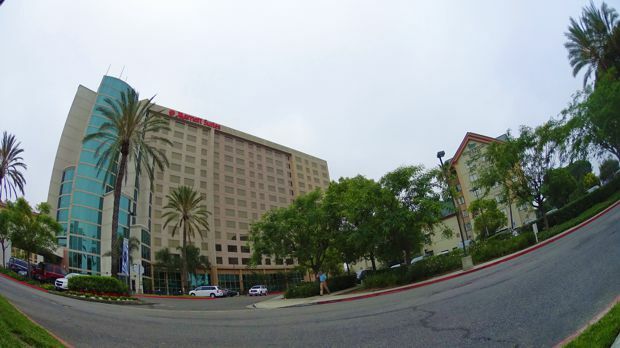 I would much prefer this "Anaheim" Marriott over its bloated cousin down the street which charges nearly $30 to park and requires an epic walk from the parking garage. I found this hotel clean and comfortable with a smiling, attentive staff. The bed was comfortable, quiet, and roomy. The 4pm check-in time is a bit late for my tastes. Tip: Marriott Suites in Anaheim isn’t technically in Anaheim, so if you program a Marriott in Anaheim into your GPS, you may be sent to the wrong location (as I was). Once I found the proper hotel, I was pleasantly surprised to find it not as crowded, the walk not as far, and parking free. 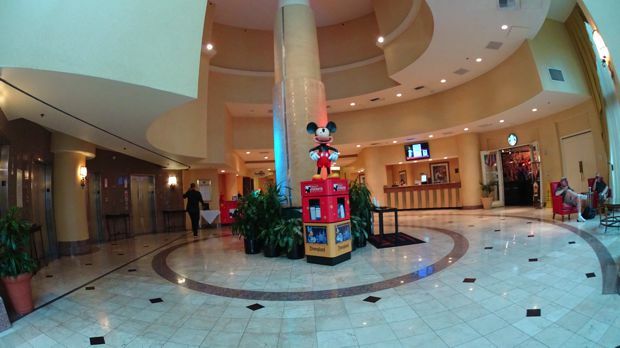 The lobby was welcoming and included an entrance to Starbucks and a complimentary fruit water dispenser. There are several restaurants within walking distance, such as Joe’s Crab Shack. It appears that this location caters to Disneyland visitors, with a booth set up for tickets. 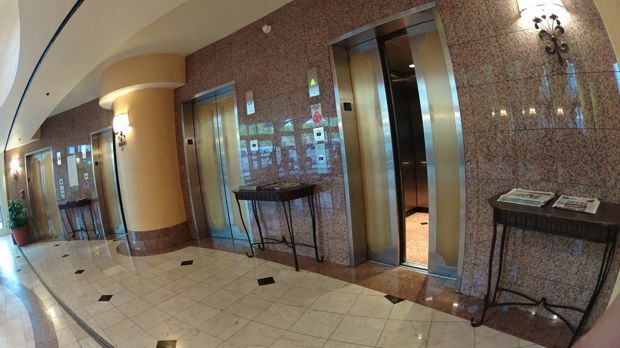 There are four elevators, which seemed ample for the number of guests. I rarely found myself in one of those epic waits at the elevator. There is a pool, hot tub, and fitness center. I found the staff to be attentive, friendly, and efficient. The check-in and check-out process was quick and hassle-free. Unlike far too many hotels I’ve stayed in before, I didn’t hear cleaning carts clanging around the halls early in the morning. 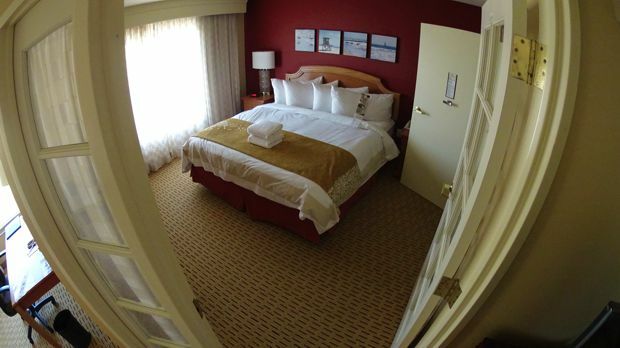 As the name implies, all of the rooms at this location are 2-room suites. You can get a 1 King room, or a 2 Double room. 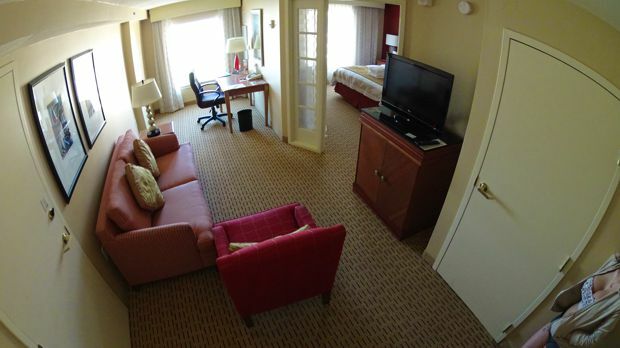 All rooms also include a sofa bed. The bedroom area can be closed off by a set of double doors. 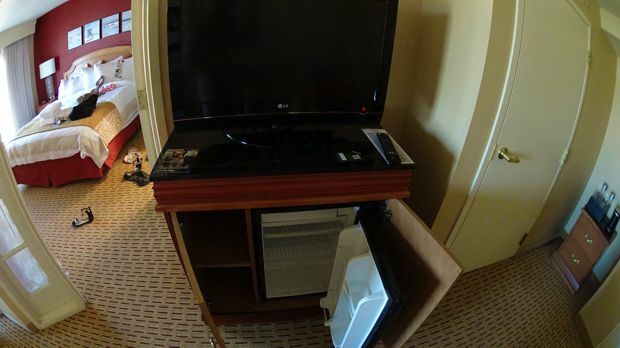 There is a mini-fridge, desk, sofa, and television. You can also find a small selection of snacks and water for purchase tucked away by the entrance. A mini-fridge is always a plus. Desk area with a view. The bathroom is stocked with a small supply of soap, shampoo, and conditioner. 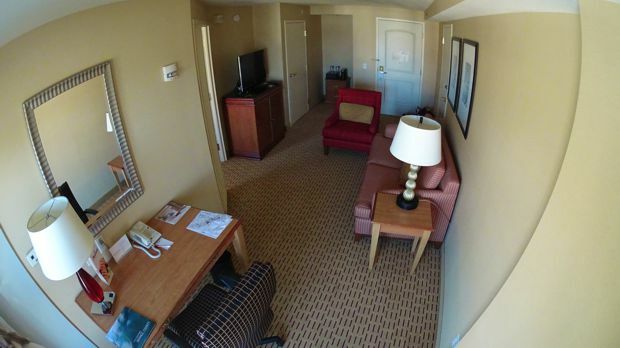 The king suite I stayed in was on the 10th floor at the end. It was handicap accessible, which I didn’t require, but also didn’t feel much different than other rooms. 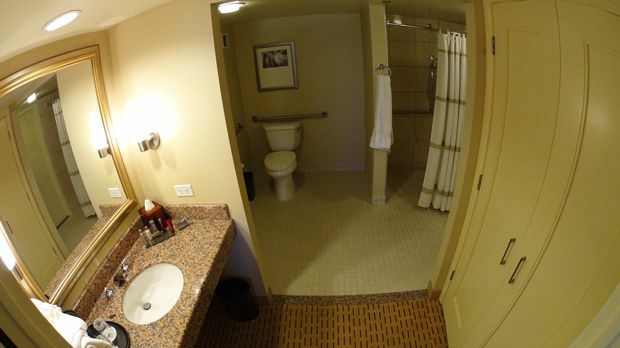 The bathroom area can be accessed from the living area or the bedroom. 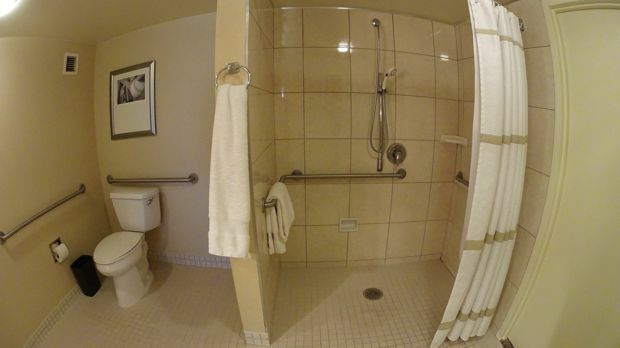 It includes a closet, toilet, vanity area, and shower. The vanity is not separate from the rest of the bathroom area, meaning someone wanting privacy in the bathroom needs the vanity area to be vacated. Unlike the Marriott which actually resides in Anaheim – where parking is nearly $30 – you can park here for free, at least on some days. The website states that it costs $12-$17 to park here, but that was not the case during my visit (perhaps only on specific days?). The walk from the parking lot to the rooms did not feel excessive (which does seem to be the case at the other Anaheim Marriott). 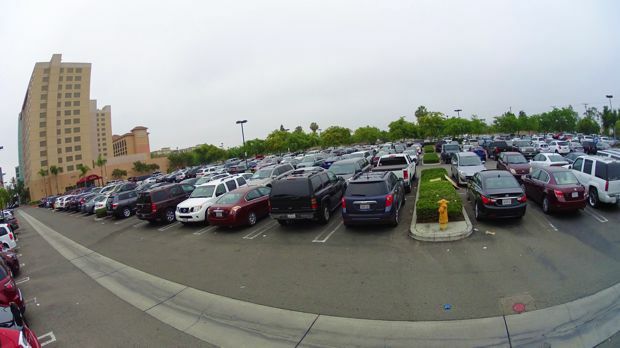 The parking lot is shared by a couple of properties, and seems to be near capacity at most times. 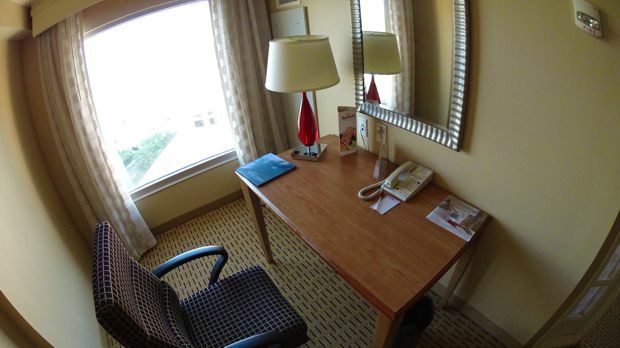 Have you stayed at the Marriott Suites in Anaheim/Garden Grove? Tell me what you thought in the comments below.